N owhere is the power of women in early England more evident than in the number of canonised royal abbesses. Among the Wuffings we have the daughters of Rædwald’s nephew, King Anna. These include the famous St Æthelthryth, founding abbess of Ely, St Seaxburh, queen of Kent and founding abbess of Minster on Sheppey, and St Wihtburh, Abbess of Dereham. St Seaxburh provides the genealogical link between the Wuffings and the Æscing dynasty of Kent and the formidable royal ladies there, such as St Mildred, founding abbess of Minster on Thanet. 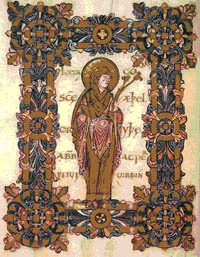 Also related to the Wuffings was the famous Northumbrian Abbess St Hilda and her sister St Hereswith, who was married to Rædwald’s nephew Æthelric. Finally, we shall consider the extraordinary story of St Balthild, a lady of apparently English, possibly even East Anglian, noble family who was captured by Franks and sold as a slave, but who later became a princess, queen, abbess and saint. Sam Newton was awarded his Ph.D in 1991 and his first book, The Origins of Beowulf and the pre-Viking Kingdom of East Anglia, was published in 1993. He is a Director of Wuffing Education and Time Team historian has been researching, lecturing, and writing as an independent scholar in Wuffing and Early Medieval Studies for many years. His latest book, The Reckoning of King Rædwald, was published in 2003.